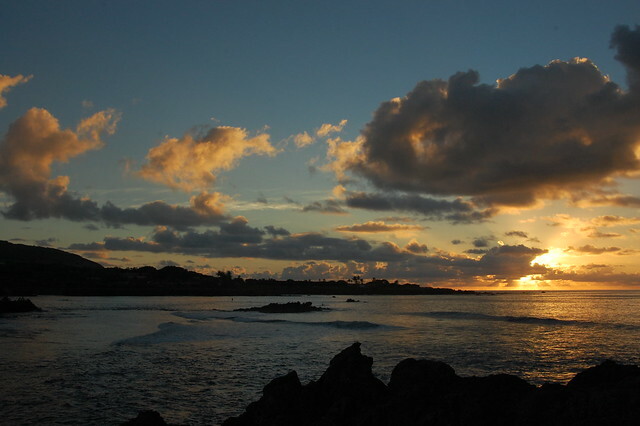 As mentioned in my previous post on Rapa Nui, I’d managed to lose my camera on my fourth day on the island, but was determined to find it, mostly so that I would not lose the pictures I’d taken (it’s always about the pictures!). 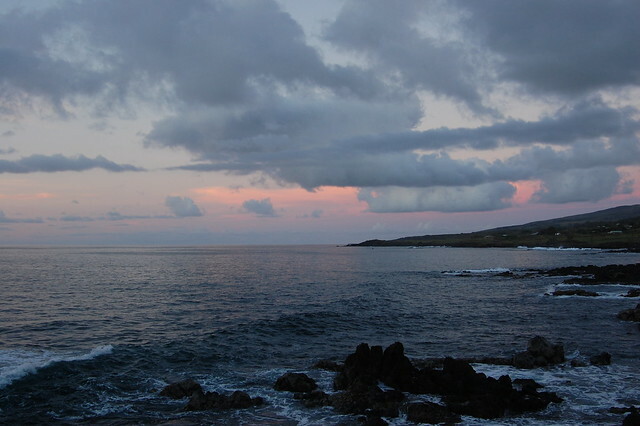 I got up early, soon after sunrise, and set out on the long walk up the north coast to where we’d watched the sunset. 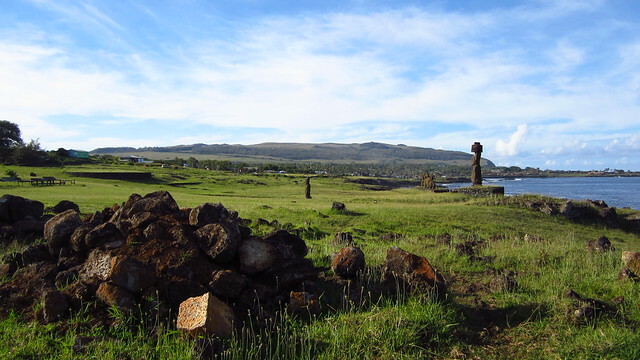 Since it was Sunday morning, I’d hoped to go to a church service to hear the hymns sung in Rapa Nui, but it was not to be this morning, although I passed another traveler on her way there and directed her to the church. Luckily, I’d chosen the site we’d watched the sunset because there was an open, less rocky pathway towards it from the main road, and it was easily recognizable to me when I came across it again. 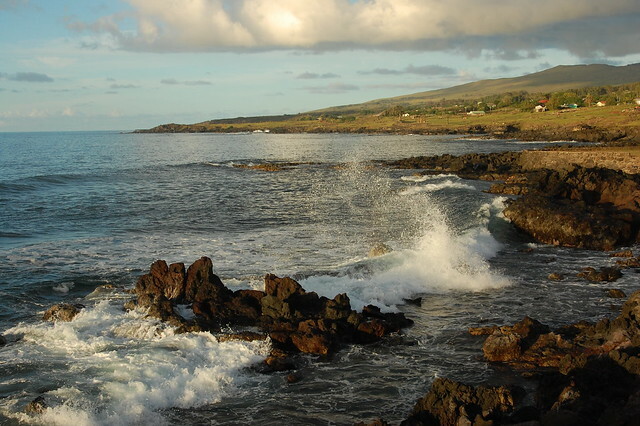 I saw the cove, and walked over to it, determined to search every inch of the black volcanic rock until I found my camera in its black camera case. Thankfully, I didn’t search long; I suddenly remembered that I’d set down my backpack on a rock close to the entrance to the cove to pull out my camera case, where it might have fallen. In one joyous moment, I spotted my camera lying where I’d thought it might be, resting against a large rock. Words cannot express my excitement at being reunited with all those pictures!! From there, I had to head back to the town, this time in the rising sun. I managed to get some nice pictures in the morning light, illuminating the moai of Ahu Tahai from the front. It would have been fascinating to revisit all the other ahu at different moments of the day, just to see how the light differs there! 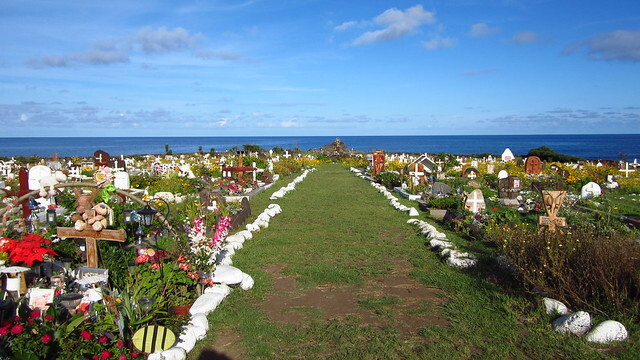 I also walked past the always-stunning, cheerful Rapa Nui cemetery. This is the type of place where I’d like to be buried, surrounded by beautiful flowers celebrating my life. By the time I made it back to my residencial for breakfast, my feet were completely shredded. Long days of walking, in shoes perhaps not suited to it, had led me to get a number of blisters on the balls of my feet and toes. I was limping, and my body was crying to me to take a day to just rest and recuperate. I decided to spend the day in Hanga Roa, make lunch, and then meet up with my friend to say goodbye before he headed on to his next adventure. One of the advantages to having so much time on the island is that I did not have to rush to squeeze everything in. That evening, I decided to limp down to the water to watch the sunset again (and grab some more ice cream!). I knew my feet wouldn’t be able to carry me all the way to Ahu Tahai, so I sat in a park just on the outside of Hanga Roa, where some of the friendly, roaming dogs followed me. 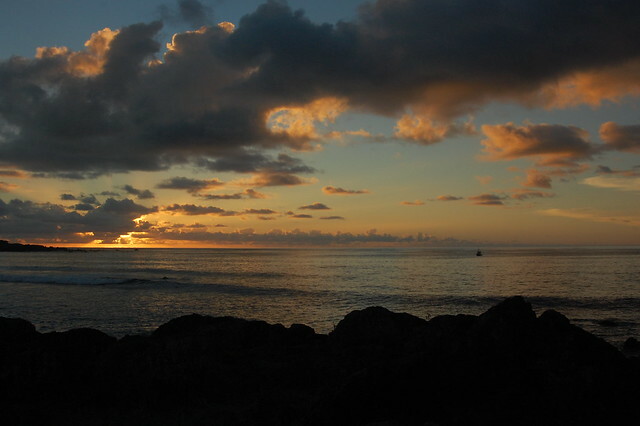 I enjoyed the golden sunset and simple colors, perhaps not as stunning as the night before, but still special. And then I headed back to the residencial to do some research for the next day; I knew it was time for me to explore the south coast, and I was almost certain I was going to do it on bike. 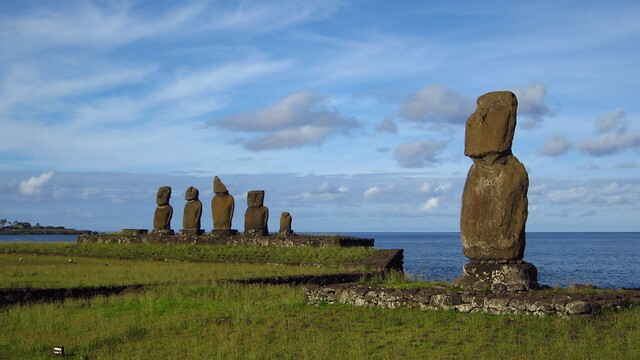 After a day of recovery, I was ready to get out there and explore more ahu and visit the quarry where the moai came from. I needed a good night’s rest. *One* Week Left in Huaycán!